Many of the details surrounding Norman's childhood are also unknown. But most of what has been unveiled can definitely be described as traumatic. 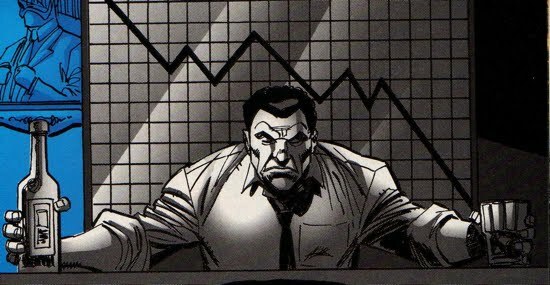 Returning to Spectacular Spider-Man Annual #14, we see that after Amberson Osborn lost the family fortune, he became an abusive alcoholic. 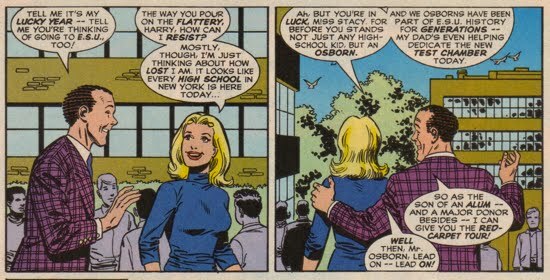 He would lash out and physically abuse Norman and his mother, blaming the young Osborn for not being able to "earn his keep." The guilt-ridden Norman then kills the family dog because that would be "one less mouth to feed." Norman also opened up about his past to his nurse Kolina Frederickson in the Revenge of the Green Goblin #1. He discussed the torture his father put him through as he struggled to make a man out of Norman. Alcoholism caused Amberson to unleash heartless tirades toward his son, severely damaging the young boy. Amberson also subjected Norman to psychological abuse as well. 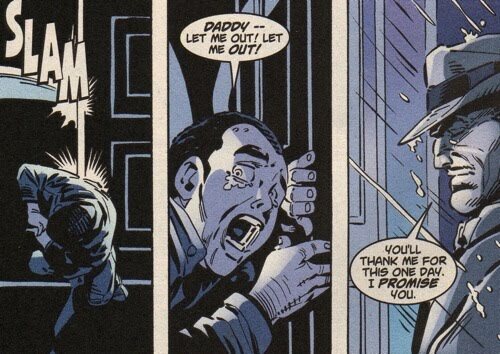 In Peter Parker Spider-Man V2 #25, Amberson imprisons his young son in one of the family's abandoned mansions, in an effort to make Norman "face the darkness". 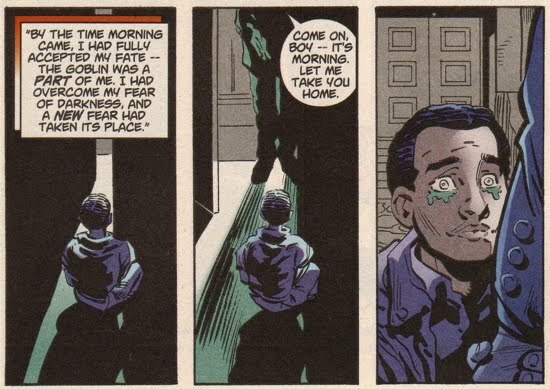 While in the darkened mansion, Norman is haunted by a "green, goblin-like" creature that he sees when the lightning flashes. This creature causes Norman to "fear the light" and embrace the darkness (since in the dark he could not see the goblin). It is very likely that this traumatic event led Norman to eventually adopt the guise of the Green Goblin, to strike fear in his enemies in the same way that the Goblin scared him as a youth. 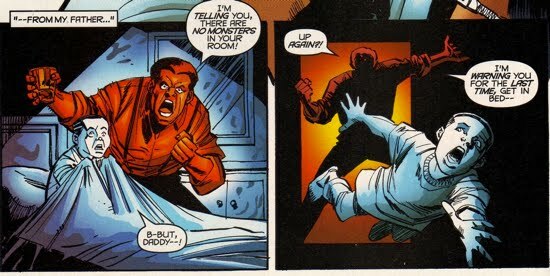 Norman's abusive past was further explored in Dark X-Men #5, after the X-Man Nate Grey infiltrated Norman's psyche. Grey manipulated Norman's X-Men to release the Green Goblin aspect Norman's personality and after the Goblin was released, he observed Norman's past. The Goblin revisited the violence bestowed on Norman by his alcoholic father. The Goblin later aided Norman in expelling Nate Grey from his brain. Not every aspect of Norman's upbringing was this brutal, in fact, in Peter Parker Spider-Man #96 Norman himself states that he read comic books and H.G. Well's stories as a kid. He even considered a literary career for himself, but that the "starving artist thing...it held no appeal." Norman's main goal in life became the restoration of his family name, and he worked to accomplish that goal at any cost. Norman would survive his tough childhood and, like many Osborns before, he would attend Empire State University. 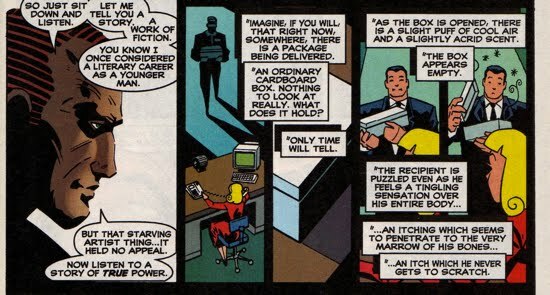 Harry mentioned that fact to Gwen Stacy in Untold Tales of Spider-Man #25. The specifics around what Norman studied are not found in-story anywhere, but most assume he studied biochemistry.